There is one place Yahoo (s YHOO) can easily finish first: the company with the worst and most ineffectual board with the spine of a centipede. I have not been a fan of Yahoo’s board for a long time and nothing really has changed my mind. Even before the firing of Carol Bartz, Yahoo’s board has been taking actions befitting a coalition government. Yahoo’s stock performance only proves that fact. From a high of $33 a share in October 2007, Yahoo is now down to $13.50 a share. Ouch! J.P. Morgan analyst Doug Anmuth in a note to his clients this morning argued that more than Bartz, shaking up the board will be a sign that Yahoo is serious about change. “Yahoo!’s Board has generally been viewed as slow-moving and more passive; any kind of shake-up here will suggest greater interest in value creation, in our view,” he wrote. And despite the firing of Bartz, Yahoo is not even close to being out of the woods yet. In fact the company is on the verge of falling flat, nose first. Earlier this morning I was chatting with Ben Schachter, Internet Analyst with Macquarie Securities about Yahoo. “I think that the core business is in even worse shape than expected,” he said. “Also, no one’s talking about it now, but I think the search business is going to face a structural and rapid decline.” And if this continues then Yahoo’s high-margin display business is going to decline pretty sharply. Firing Bartz doesn’t change that. Why? Like everything else, let’s blame it on the iPhone (s aapl) and Google (s goog). Search consumer behavior is steadily shifting to mobile and that limits the opportunities for also-rans like Yahoo. Google has done a good job of positioning itself on mobile and so has Microsoft (s msft) via Bing. Yahoo’s mobile strategy is at best foggy. In other words, if there is a future for Yahoo, then it involves a complete and strategic overhaul. It needs to become a highly focused company. The Peanut Butter Manifesto made interesting reading and identified some core problems but in the end it didn’t really offer any answers. What Yahoo needs to do is be honest with itself and divest everything that links it to the past of the Internet. It needs to sit down and see what are the core assets that help the company move forward. Whether it is Yahoo Japan or its Alibaba stake, it is time for Yahoo to lock in the gains. 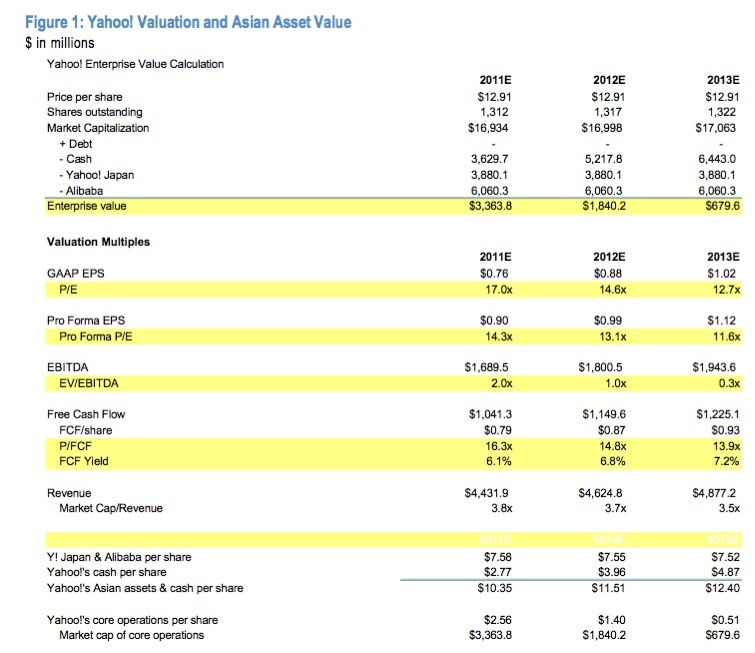 Those Asian assets are the reason why Yahoo has a market capitalization of around $17 billion. (See the graph from J.P. Morgan.) If Yahoo can sell off those two assets, the company becomes attractive to private equity buyers like Silver Lake Partners, the big technology buy out firm. Yahoo has a lot of assets, starting with 600 million folks who still believe in the company. I am one of those and still use My Yahoo page for keeping track of things like cricket scores, my fantasy league and even weather and political headlines. A lot of small businesses love Yahoo’s shopping platform, however aging that might be. And now it needs to bet the farm on the future. I think anyone who takes over as the CEO should come in with eyes wide open and one condition — fire the board. Yahoo has a nine person board and it is time for Yahoo to go for a complete facelift. With the exception of Brad Smith, CEO of Intuit (s intu), Jerry Yang, Co-founder and Chief Yahoo needs to infuse new blood on the board and bring on folks who have a deeper understanding of the changes around and ahead of the company. Here are the kind of people I am thinking Yang should be calling — Paul Maritz of VMWare (s vmw), Sheryl Sandberg of Facebook, Verizon (s vz) CEO Ivan Seidenberg and Paul Jacobs of Qualcomm (s qcom). They can bring insights into cloud, social and mobile landscapes. To get a better grip on Silicon Valley and early stage innovation, Bill Gurley of Benchmark Capital and Reid Hoffman of Greylock Capital are two names that come to mind. Now beyond tech, Yang should be looking at folks like Mickey Drexler of J.Crew (s jcg) or American Express (s axp) CEO Ken Chenauth and Ford (s f) CEO Alan Mullaly. They would bring vital insight into retail, money and transportation in the era of “connectedness.” And to top it off, Yang should get former News Corp. (s nws) president Peter Chernin, who started his own entertainment company, to sign on as the chairman of the board. When all this is done, the company needs to buy a few key companies in order to build for the future. Hulu would be a good asset to add and so will smaller social sharing applications. These could include startups like Foursquare and Flipboard that help Yahoo understand that in the world of mobile, the very idea of media is not constrained to web-pages and banner ads. What do you guys think? I also backup the WebOs/Hp fusion, but add the Samsung factor to the equation. Samsung seems to be looking an extra partner (besides android/google) to empower Bada… Would yahoo fit? How can you write an entire column about revamping Yahoo’s board w/o questioning Jerry Yang’s leadership, both as a board member and former CEO? Here’s something they could do. Every 6 months have a contest for the best new online content/game/social media/business app idea. Have a section on the Yahoo home page that promotes and markets the newest winner and push it till they’re red in the face. In return for hosting their application at Yahoo, the innovators get $100,000, 12 months use of free office space, and access to Yahoo’s infrastructure and data. After the 12 months are up the company can go on it’s way or stay on as a Yahoo application. This would be an easy idea for them to implement. Yahoo should start buying online magazines, esp. tablet-ready ones. They can’t compete with Google and Apple, but they can at least compete with AOL in the content arena. From an investor’s point of view, Yahoo is a doomed company. The company has no future, and I don’t know of anyone visiting yahoo anymore, except for the visits it gets from Google through its answers. You’re right on the board problem. You’re just dead wrong on the acquisition “solution”. First of all, acquisitions almost never remake a company. Second of all, you’re talking about spending ~$4 billion to get Hulu + Foursquare + Flipboard. Exactly one of those has any revenue at all. Oy vey! They need to think small and cheap on the acquisition front, not pricey and business-model-free. Yahoo, like HP, is too anachronistic, too damaged, too set in its ways to survive. We’ll see the breakup of these two companies soon. I would also add that Yahoo still has significant consumer use of Mail and IM. Even people who have gmail accounts still have/use these services, and gmail/google talk are not so great that Yahoo couldn’t make a comeback. They just need to have a few good ideas, and overhaul the interfaces (plus have better integration). The Web is still primarily used for three things: communications, sharing, and shopping. Yahoo has strengths in each of these areas. They need to simplify and delight users. Well, I think HP’s board is the worst ever. Carving up the company is nonsense. Yahoo! has already carved itself to near-death. If there is any way to recover shareholder value, it will only be through restoring health to the assets that are left and growing them into a new strategic platform. It’s not just the board that needs to go — it’s all these insane proposals to dance on the corpse and toss the baby out with the bathwater. Yahoo!’s only remaining asset that is still worth anything is its employee base. Alibaba can Yahoo! Japan could tank at any moment for completely unforeseeable reasons. The employees will still be there. If you have no faith in them, just sell your stock and get out of the company. this is the most sane and rational comment among the hundreds i’ve read since the news broke. Yahoo! does need a house cleaning but it is among the rank and file (director and below) where there are many problems. I left Y! over four years ago, when I looked at my LinkedIn profile most, not all, of the top-notch Yahoo!s have left for other companies…while the “process first”, “yes men”, and “we can’t do that person” are all still there. The poison is deeply embedded inside Yahoo! and nothing short of a complete cleanse will help fix that organization. Jerry, David: you could make a huge impact by rooting out these internal road blocks. Bring back the real purple! Why would a non-desperate company sell themselves to YHOO? The first thing Y! needs to do is not make it IMPOSSIBLE to work with them. Have you tried to get a decision out of them recently? No one is empowered to say yes or no. They need to put individuals in charge of products and allow those individuals to make decisions. If you do that there is product ownership. The buck stops somewhere. Put together mutually beneficial partnerships with start ups and then maybe a year from now they’ll have the credibility back to acquire some of them. But it all starts with product ownership. Indeed that is where it all starts. And I do agree at some point that is what goes wrong. Om, agreed that there needs to be a housecleaning, but it needs to be a complete housecleaning. A completely new board should be formed and the new CEO be Chairman as well. It’s worked well at other companies. Next up, they need to look internally and like Apple, refine their product line down to some very core products/services which are generating revenue. They need to tighten where they can and realign some projects, some people and then get down to where the company can go, and map out from destination to startline the ways to achieve it. Some of us have already done and and know what it can be, know how it can get there. All we’d need is a board to listen to that and be prepared to step down and seat a new board with quality people with a vested interest in seeing the company succeed vs. fail. But we’ll watch and wait and see what happens as we’ve done before. They know the number if they choose to call. I completely agree. It’s been years since Yahoo actually built a good consumer success story (put aside the open source Hadoop platform which is not really consumer product). At the same time they managed to kill some of the better brands out there like Filckr. Many people see the 600 million people as their biggest asset, but it’s also their biggest obstacle. Yahoo size makes it hard for them to move fast and innovate. And one more thing on the board – a board that doesn’t respect their CEO enough to actually fire her over the phone, should not get the public respect back. Haha :-) I gave up on those guys. All the discussion around financial engineering (near term acquisition targets etc) to stimulate growth is misguided. What is required at Yahoo is visionary leadership. Leaders that are focused on doing the real blocking and tackling of understanding where the competitive gaps reside and building a company that addresses them head on. What’s wrong with Yahoo can be fixed ONLY…if the new leadership stops avoiding the obvious gaps in their strategy. Yahoo has got to get hungry again with leadership that can rekindle that start up fire present so many years ago. Enough with the constant obsession with stock price. Fix the problem…Sell and market more effectively…Problems will get fixed. Agreed that the board must go. Even if search were to remain strong as a category, Yahoo! has not been competitive there for a long time. But there is still room for things Yahoo! does well. Content aggregation (finance, sports, MyYahoo), and their new email client is really good (on iPad, too). They’re better than Yahoo! and MS at helping users to consume lots of data quickly from a pleasing interface, but they’ll need huge improvements on the mobile side, and possibly a whole new approach to entertainment (Hulu + Rdio + ???) to remain relevant and justify even today’s stock price. I think Jonathan Black is mostly right, but a quick Foursquare buy makes a lot of sense on many fronts. Why not use Y! reach to help push Foursquare to 50M+ users, but give Dennis complete autonomy over the business unit? At the same time, be grooming Dennis as the CEO after this next actor takes all the spears of doing the necessary cleansing. In short: get an Iacocca now, and home-grow a Jobs-like leader for the future. It’s a tight spot to escape from, and they need epic moves! Does one define a strategy first and then get the people to refine, drive and implement it. Or does one hire people to define a strategy [design by committee]. If the future is mobile then data organization is mobile, means data has to be organized to fit a situation. Google uses a category [location] to partially fit this criteria. But any situation[even cyber ones] requires more then just location to find/organize and make accessible the right data for a given situation. Means there is plenty of room to pass Google/FB/…., Yahoo’s roots are in data organization[right now they are a hodgepodge of (…)]. Means I don’t see anyone on that list to drive/refine data organization, maybe I’m wrong. Mobile for mobiles sake is not a good solution. See also Steve Jobs on strategy [1 @1:30]. uups, hope got it right this time. player_embedded not such a good idea anyway. The concern I have about Hulu is that it could become another excite@home. After the acquisition, content partners will give access to their libraries for several years but then what? I would ask for a 5+ year commitment before making an offer. I think a 5-year commitment is part of the sale deal though the current terms hold for 2 years or so. Or so I understand. Trying to dig into this. Your suggestions for the board sounds fine. Regarding acquisitions, given Yahoo!’s track record why would serious, innovative, entrepreneurs sell to them? What have they done with Flickr? If I’m Mike McCue I’m running in the opposite direction. I know that is the problem and that is why the overhaul has to be complete and drastic. I think Yahoo! needs to prove for at least 4 consecutive quarters that they can successfully evolve manage their own businesses before they can be looked at as a good buyer. If I’m right this puts the company back to where it was when Terry Semel was CEO. Actually its even worse than that. They still had options back then. Bottom line. Yahoo! needs to straighten out its own affairs before they go asking someone else to dance. Otherwise it won’t go well. As for some specific suggestions, I don’t know. For me Yahoo feels like a cultural artifact from the late 1990s. They just don’t seem very important in 2011. With the foul experience Dennis Crowley had after selling Dodgeball to Google, I think there is little chance of him even thinking of selling foursquare to Yahoo.